Still pressured by the Brexit saga, equities in London closed down 24 points at 7,014 on Friday and are seen opening flat today as UK Prime Minister Theresa May goes on the attack over her Brexit plan, in a speech she is due to give later in the day, less than a week before EU leaders are due to rubber stamp the deal. A quiet day ahead on the economic events calendar. 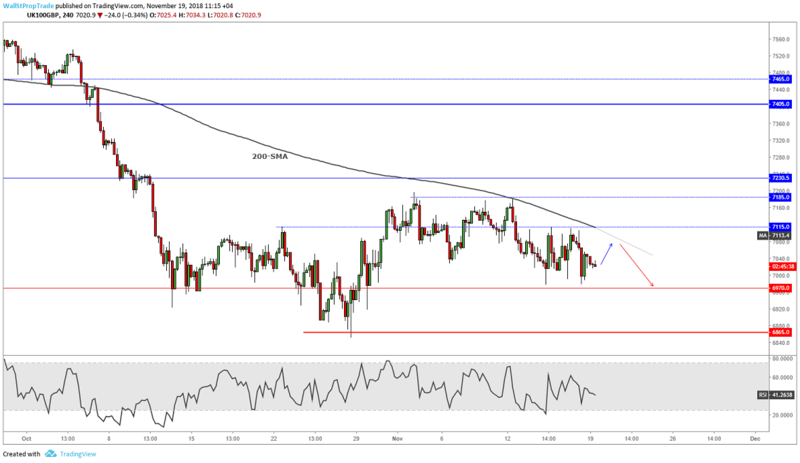 The FTSE 100 failed to decisively move beyond the previous day's trading range as the bears took control ending the day lower. The index is still trading below the 200-period moving average which is acting as resistance. The trend is clearly bearish, showing an intact downtrend in the short, medium and long-term as the RSI looks bearish on the 1H, 4H, and the daily charts.